Crafted aluminum heatsink, 5mm on thickness, larger coverage area top&bottom for best heat dissipation. The full heatsink kit including top&bottom heatsinks and 2 x quality silicone pads. Need Assistance?. Compatible with all standard SDR/DDR SDRAM. Improve RAM performance and avoid system crash by dissipating excess RAM heat. Effective size fits most ram. Material: aluminum alloy. Applicable Hard Disk: M.2 2280 Solid State Hard Disk. Included: 1 x M.2 SSD Heatsink Cooler. The heat sink is treated by anode sandblasting process, which has fine texture, anti-corrosion and rust-proof, and is not easily dirty. Compatible with all standards DDR DDR2 DDR3 SDRAM. Heatsink Physical Radiator. Dissipates RAM heat, improve its performance. Colour: black. Improve RAM performance and avoid system crash by dissipating access RAM heat. Material: Aluminum Alloy. Also note that monitor settings may vary from computer to computer and may distort actual colors. Included:1 X PC RAM Cooling Case. Better protection and static shielding for your PC RAM. Compatible with most DDR/DDR2/DDR3/DDR4/ECC RAM models. Aluminum alloy material, great performance. Material: Aluminum Alloy. PcCooler NB-400AL Northbridge Cooler Aluminium. 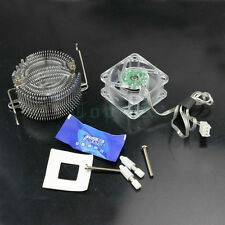 Heatsink & 40x40x20mm Cooling Fan. Chivs86 PC Cooling Supplies. Fan Speed : 5,500RPM ±15%. - Fan Cables -. - Brackets & Backplates -. - RAM Heat Spreaders & RAM Heat-sinks -. Compatible with all standard DDR SDRAM. Material: aluminium alloy. Colour: blue. Dissipates excess RAM heat. I WILL ACCEPT. Applicable Hard Disk: M.2 2280 Solid State Hard Disk. 1 Aluminum Heatsink for M.2 2280. Material: aluminum. Color: silver gray. 3 pin connector and two blue led fans. Product Name : Memory Heatsink;Material : AluminumSize : 12.6 x 2.7 x 0.7cm/ 5" x 1.1" x 0.3" (L*W*T)Color : BlackNet Weight : 39gIncrease the reliability of your system by cooling down the memory.Improve RAM performance and avoid system crash by dissipating access RAM heat.Compatible with all standard SDR/DDR SDRAM.Effective size fits all motherboard.Easy installation with spring clips.Come with conductivity thermal adhesive tape.Package Content:2 x Memory HeatsinkNote:Light shooting and different displays may cause the color of the item in the picture a little different from the real thing. The measurement allowed error is /- 1-3cm. MPN Does not apply Brand Unbranded UPC 4894462141557 EAN 4894462141557 ISBN 4894462141557 Design. Improve RAM performance and avoid system crash by dissipating access RAM heat. Material: Aluminum Alloy. Color: Red. Also note that monitor settings may vary from computer to computer and may distort actual colors. Material: Aluminum & Conductive Heat Tape. Mini Aluminum Heat Sink. 8 pcs / aluminum heat lotedissipador. Color: Blue. Also note that monitor settings may vary from computer to computer and may distort actual colors. RGB light, 256 colors changed automatically. 1 Bag X Spare Installation Accessory. Adopt Bilateral aluminum for magnesium alloy material, help the cooling. With small 4 pin motherboard port to connect more ports. MASTERLIQUID ML120L RGB. MasterLiquid ML120L RGB makes syncing the lighting easier than ever before. Once installed, the MasterLiquid ML120L RGB requires zero maintenance for optimal silence performance. Quantity: 1 set (8pcs). Great for high performance or over clocked systems. High conductivity thermal adhesive tape. Kuhler H2O K120. KUHLER H20 K-SERIES. - Low-Profile CPU Block. The uniquely engineered pump is integrated with the radiator, preventing unwanted vibrations from damaging the CPU. Low-Profile CPU Block. Due to the light and screen setting difference, the item's color may be slightly different from the pictures. Quantity: 1 Set. Features: Durable, Easy to Use, Portable, Useful. Aluminum 14X14X5.5MM IC LED Cooling radiators. Use for electronic, LED ,IC,CPU,GPU,CPU,RAM,CHIP computer 's component heat dissipation. Exteral Size:14 14 5.5mm. IMPROVED HEAT DISSIPATION: Evenly spread direct-touch heat pipes and an optimised heatsink design with 54 cooling fins lead to an ideal heat dissipation for the Freezer 34. RGB Sync Via Motherboard OR Integrated RGB Hub. - Ultra-Efficient PWM Radiator Fans. RGB Lighting. - RGB LED Lighting. 256-colour RGB LEDS Lights. - Multiple RGB modes: Single colour, breathing, flashing and gradient colour cycling. Combat heat with Antec’s C40 CPU Cooler. Four high performance heatpipes and 8mm thick copper coldplate work together to quickly transfer heat away from your CPU. Full Copper Coldplate & Four Heatpipes. Type: SSD Heatsink. 1 x SSD Heatsink. Features: Dual Thermal, with Fan, Silent. With 10000RPM fan, mini and silent. 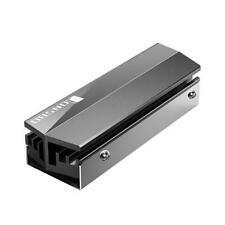 Support various M.2 hard disk, dual thermal design make it cooling better. Due to the light and screen setting difference, the item's color may be slightly different from the pictures. Compatible with all standards DDR DDR2 DDR3 SDRAM. Dissipates RAM heat, improve its performance. With thermally conductive adhesive tape. Material: aluminum alloy. Color: blue. And due to the difference between different monitors, the picture may not reflect the actual color of the item. Optimized natural convection. Pre-applied adhesive thermal tape. Applicable to single and double sided modules. Color: Red. Quantity: 1 PC (other accessories demo in the picture is not included). Length: 12.8×3cm/5.04×1.18in (approx). (enclosed thermal tape). Weight : 20 g. Material : Aluminum. Contents : 8 pcs. Aluminum 14X14X6MM IC LED Cooling radiators. 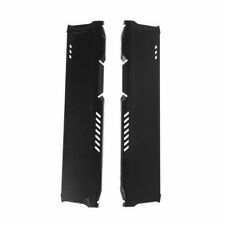 Use for electronic, LED ,IC,CPU,GPU,CPU,RAM,CHIP computer 's component heat dissipation. Exteral Size:14 14 6mm. Watt: 65 W. Socket: LGA 1150/1151/1155/1156. Fan Speed: 2200 ± 10% RPM. Product Details & Features. Use for electronic, LED ,IC,CPU,GPU,CPU,RAM,CHIP computer 's component heat dissipation. Condition:100% New. Fully tested and working component pulled from new or factory refurbished machines. See title! No collections allowed. Product Type . #Hide#115x Sockets: Supports Sockets 115x. The high thermal conductivity of aluminum is fully retained by a new type of extrusion. This new production process creates a powerful yet very compact radial heat sink. The aluminum provides low weight and good thermal conductivity. Material: Aluminum. - 8 pieces of aluminum radiators. Dissipates RAM heat improving its performance. High conductivity thermal adhesive tape. Great for high performance or over clocked systems. Effective size fits on all motherboards. Improves performance by dissipating heat. Double sided thermal tape is included making installation easy. What you see in pictures is what you get. 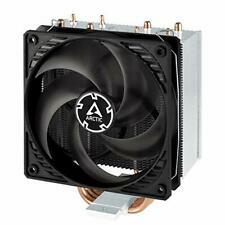 Heatsink and Silent Fan for AMD® Sockets 754/939/AM2/AM2 /AM3. 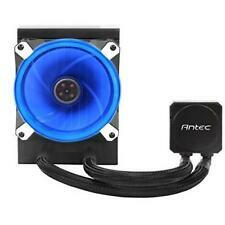 • Ultra quiet 92mm PWM fan with low noise impeller. Ultra quiet 92mm PWM fan with low noise impeller. Patented fan holder eliminates the buzzing sounds. MacBook 13" Alu Late 2008 version! Laptop Heatsink. Fully tested and working Laptop Heatsink pulled from new or factory refurbished machines. DOA WARRANTY ONLY (Dead on Arrival). Will Fit No collections allowed. 8 x RAM Heat Sink. Dissipates RAM heat improving its performance. High conductivity thermal adhesive tape. Color: Silver. Great for high performance or over clocked systems. Effective size fits on all motherboards. 1 x SDR RAM DDR Heat Spreader. RAM Heat Spreader dissipates RAM heat improving its performance;. The material outside the product adopts the full anode process to maintain the durability of the surface texture. Orders placed on weekend will. checkout, it can't be changed once order completed. for it free. Fully tested and working Heatsink, pulled from new or factory refurbished machines. Will Fit No collections allowed. Features: 1.Every product has a unique Manufacturing Part Number label on the inner package that proves it has been qualified,which include Part Number,Model Number and inspection date information; 2.If you have any questions about the item,please provide us the Manufacturing Part Number for checking,your profits will be guaranteed. 3.Fit for PCIe NVMe NGFF M.2 2280 SSD 4.Heat aluminum bar bump design, so that the cooling area doubled, can greatly improve the cooling performance. 5.Strong thermal aluminum, and with a strong thermal conductivity of silicon and disk intimate docking. 6.Heat sink material: aluminum alloy, silver plated anodized surface treatment..
Optimized natural convection. Pre-applied adhesive thermal tape. Applicable to single and double sided modules. Color: Black. Quantity: 1 PC (other accessories demo in the picture is not included). RGB light, 256 colors changed automatically. Heat dissipation: heat sink. - Adopt Bilateral aluminum magnesiumalloy material, help the cooling. - With small 4 pin motherboard port to connect more others.